I was on my way to a breakfast networking meeting. I was just finishing my 2nd year in business and after taking Gallup StrengthsFinder assessment, I learned that I was great at building relationships. Now I knew I loved people and I knew part of my purpose was to help others – but I had never really thought of this as a strength, let alone to implement this as a marketing strategy. As I was planning out my year, however, I decided to take advantage of my natural gifts and join a networking group (BNI) so that I received more referrals in my business. Now, after a year of my breakfast networking experiment with, I love referral marketing! Referral marketing is one of my top 3 favorite ways to grow my business. Think about it: when a prospect comes to you because they were referred by “so-and-so,” they’re already half-sold! By building personal relationships with other business professionals, you expand your network and meet potential clients, customers, and referral partners you wouldn’t have met otherwise and you get to introduce your colleagues to your network as well. It’s a win-win for everyone and it’s something you should truly consider if you want to grow your business in an easy and fun way. “Everything works, as long as you do,” and networking is no different. It’s a tried and true marketing strategy that when used effectively, can significantly increase your income, your impact, and your influence – as long as you make an effort to do it. Who are the other professionals in the group? Will they be able to pass me referrals? Do I have a similar client base? What will I add to the group? How far is the meeting from home? I actually visited 4 different groups before settling on my one networking group. As I mentioned above, one meeting does not a great referral make. It takes time to cultivate relationships, so you definitely want to join a group that meets consistently and where you’re held accountable to being present. Plus – in marketing, we talk about developing your Know, Like, and Trust (KLT) factor. But before someone can ever like or trust you, they’ve gotta know you! So, show up! 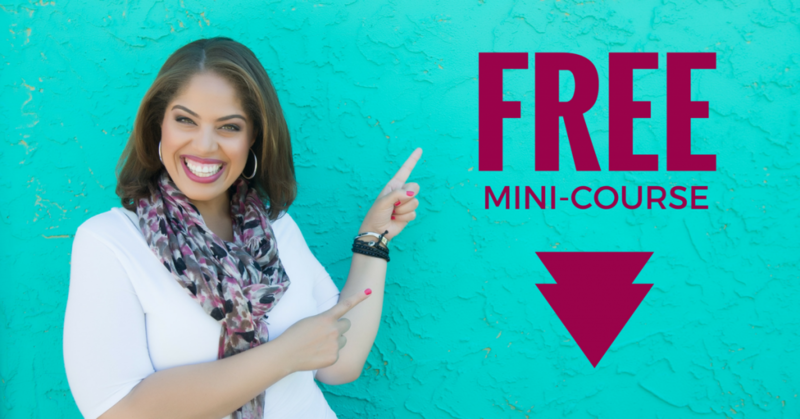 Click here to join Expand Your Network: A FREE 5-Day Mini-Course! Regardless of your personality, there are ways to just be the nicest, most likeable version of yourself. Now, I’m not saying to pretend or lie about who you really are. (In fact, if you really don’t like people – referral marketing may not be for you and that’s okay.) What I’m saying is, referral marketing is based on your relationship with other professionals. Being a warm, giving, and friendly person helps immensely, because people do business with people they like. So – smile. Give hugs, or shake hands. Genuinely show interest in the person in front of you. 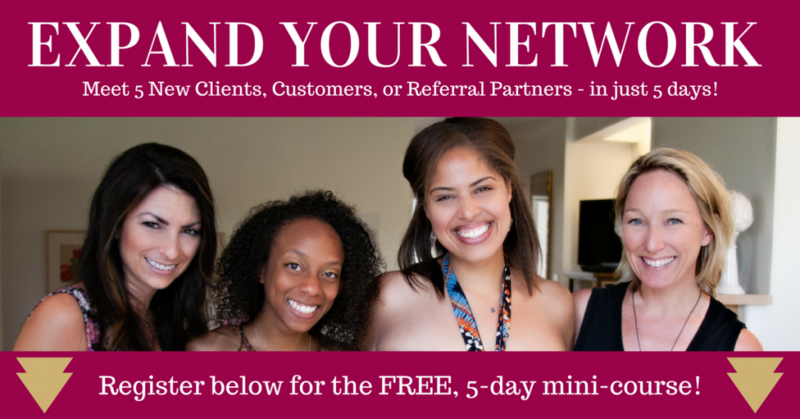 EXPAND YOUR NETWORK: Meet 5 new clients, customers, or referral partners – in just 5 days! More than just knowing and liking you, referrals happen naturally when people to trust you. This was a HUGE learning for me, because for the first two months of my business networking experiment, I didn’t receive any referrals. After attending a training on how to get the most out this breakfast networking, I learned that the quicker you can create trust, the quicker you’ll get referrals. How do you engage a room full of colleagues? Tell them a story! Most people tune everyone out at networking events (I know, I know) but if you tell a story about how your client was experience X problem, so they came to you because they felt Y feeling, and then because of your work they accomplished Z result – you are way ahead of the game! Almost immediately, people can either see themselves or someone they love as the “character” in your client story! Sing out, Louise! When it’s your turn to introduce yourself or give your elevator pitch, stand up tall, take a deep breath, and speak clearly, loudly, and succinctly. Even more than the words you use, the energy you bring to your pitch immediately tells someone whether or not you believe in yourself – and whether or not they can trust you. Because if you don’t have confidence in what you do or offer, how will others have confidence in referring you business? Speaking of confidence, I wish you could’ve seen me when the first time I visited a networking group. Aside from looking a hot mess (yoga pants for 7am business networking, anyone? ), I stumbled over my words, got flustered, and couldn’t even finished my pitch. I sat down and bowed my head, cheeks ablaze with embarrassment. After months of talking about myself every single week, though, I am a total pro at it crafting elevator pitches that pique interest, build trust, and invite referrals. I learned that no one is born knowing how to network or pitch themselves. Like any skill, it takes time, energy, and effort to grow. This one is super simple and while it is BNI’s tagline, I learned that it’s 100% true. Give, give, give. Be a valuable asset to your network. Send them referrals, help them out, and support them – it will always come back to you 10-fold. And there you have it, my top 5 takeaways from an entire year of breakfast networking! As you know, I’m getting ready to host EXPAND YOUR NETWORK: Meet 5 new clients, customers, or referral partners in just 5 days and I’d love to have you join us! The last time I hosted a mini-course,we had nearly 400 people from around the world join us so click this link to sign up! What was your top takeaway from this blog post? When will you attend your next networking event? Post your answers in the comment section below – I read every response and look forward to connecting with you! As always Alionka love your energy your wisdom and your strategies! Thanks so much, Karen! I am so glad you are part of my community!